1. Only by mobile, without any other device. 4. Statistical trends oxygen, changing habits. 2.Blood pressure for more than 95% of users, the error is within plus or minus 12. 3.Blood Oxygen error plus or minus 2 or less. 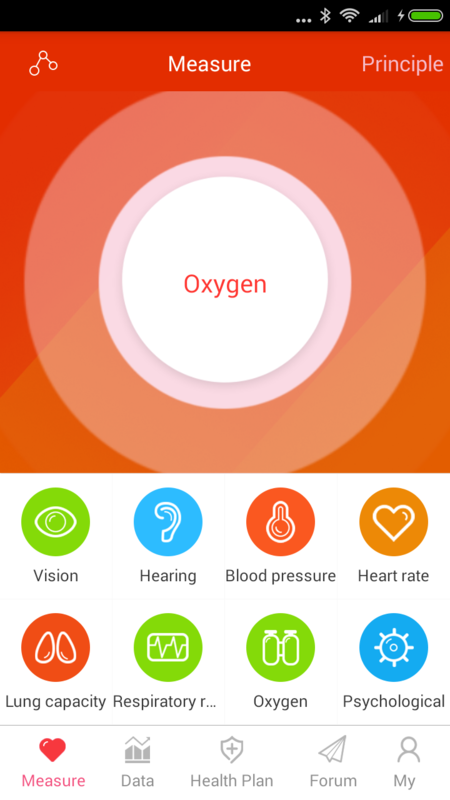 Mobile measuring blood pressure, heart rate, blood lipids, blood oxygen, vision, colorblind, hearing, lung capacity, breath rate, psychological index. Amblyopia ABC - AmblyopiaABC is a treatment software for 3-12 years-old children with lazy eye. It is Tenglnet companies and the amblyopia Institute of Cruz University jointing development. Health Break - Take a break reminder software for long-time computer users.